"Simple, quick and tasty. These ingredients go together very well. Chop the apples and walnuts depending on how coarse or fine you like the texture." 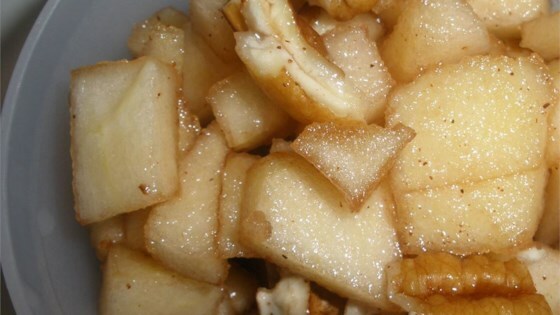 In a bowl, mix the honey, cinnamon, apples, grape juice, and walnuts together until thoroughly combined. Good recipe but I believe there was a typo. 2 cups of grape juice is way too much. Charoset is not supposed to be swimming in liquid. It should be half a cup max, of grape juice. I made a 2-apple recipe, with 2 teaspoons cinnamon, and crushed walnuts/brazil nuts combo. Next time I will try pecans or macadamias! Too much juice, poured out a lot before serving.